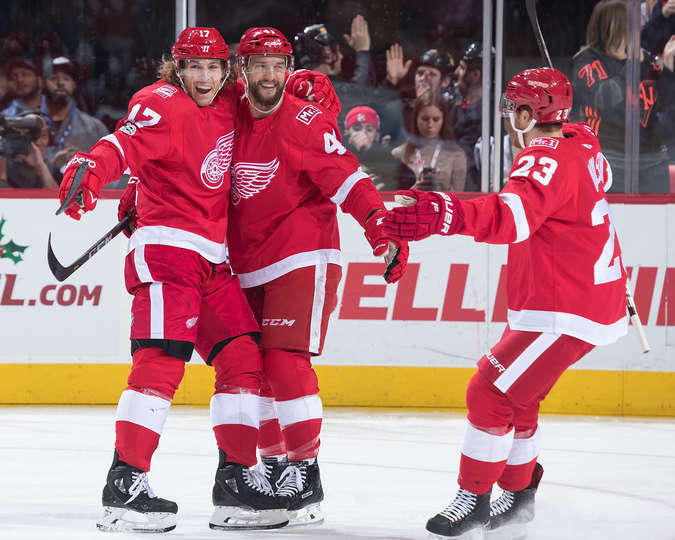 The Red Wings lost yet another game in 3-on-3 overtime. This time, it was after a valiant 3-1 comeback against the New Jersey Devils. 34 seconds into the game, on the first shift and first shot, David Booth scored his first goal as a Wing. He deflected a shot by Luke Glendening. Xavier Ouellet also assisted. Veteran forward David Booth scores his first goal as a Red Wing in a game against the New Jersey Devils on November 25, 2017. Near the 7:30 mark, both goalies, Petr Mrazek and Keith Kinkaid made outstanding saves. Mrazek robbed Jesper Bratt on a backhand-forehand chance, while Kinkaid made a splendid backhand save at the opposite end. Brian Boyle scored first for the Devils (9:12) on a great redirection from a Steven Santini wrister. Mrazek, anticipating a cross-crease pass, was already sliding right as the puck skid past his left pad. Miles Wood also assisted. Before the period ended, star forward Taylor Hall gave NJ the lead on the power play, beating the Red Wings netminder clean from the slot. Defenseman Will Butcher assisted. After a scoreless second period, an unpredictable third period played out. Detroit blueliner Jonathan Ericsson shoved Adam Henrique into Mrazek, and the Devils began to celebrate as the puck was potted after the collision. The goal was waived off for goalie interference, even though the interference was unavoidable, given Ericsson’s forceful shove. Nevertheless, the Red Wings found themselves on the power play. They failed to register a single shot on net, and with the PK momentum, allowed a goal on the very next shift. Star rookie Nico Hischier extended the lead to 3-1 with his third goal of the season. Immediately after the goal, Mrazek was told to leave the ice for an evaluation of potential concussion symptoms. It was an uncharacteristically delayed response. Usually, the penalty box is notified that a player must leave the ice. However, this time the Detroit trainer was notified, but the message was sent to the bench when he was still attending to Mrazek on the ice. It was later revealed that Mrazek passed the tests and felt good enough to continue. Jimmy Howard came in for the final 13:43, which seemed to spark a dramatic comeback. Anthony Mantha scored his 11th of the season, beating Kinkaid glove-side from the slot. Then, just over a minute later, Booth came flying off the bench and down the slot to pot the game-tying goal. It was a special night for the hometown veteran, born in Shelby Township, Michigan. With overtime on the horizon, Detroit fell for the fifth time in this young season. Defenseman Nick Jensen attempted to play the puck along the boards. Brian Gibbons also went for the puck. Gibbons fell down along the boards, leaving Jensen with time to either clear the puck down the ice or pass to a teammate. He did neither, as he proceeded to pass the puck to the Devils forward as he was trying to stand up. Gibbons took advantage of this mistake, skating in on Howard, and scoring an easy game-winning goal. Detroit moves into a tentative third place with 25 points; however Boston and Ottawa have games-in-hand. The Wings next take on the Los Angeles Kings on Tuesday (7:30).